The leader of Myanmar's National League for Democracy Aung San Suu Kyi was sworn in to Myanmar's parliament on Wednesday. 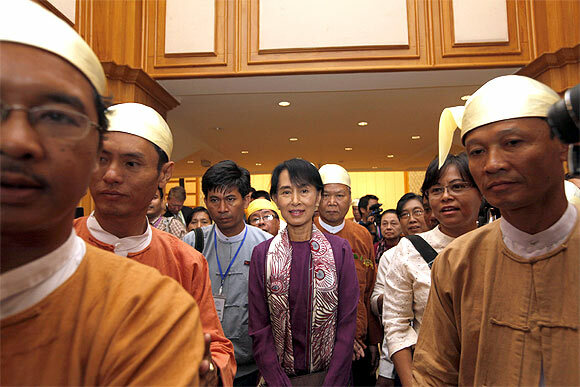 Suu Kyi's has been a staunch advocate of democracy in Myanmar and was elected as a parliamentarian. Myanmar's pro-democracy leader Nobel laureate Aung San Suu Kyi won a seat in the country's lower house of parliament after defeating her two rival candidates in a by-election in her constituency. Suu Kyi, who has spent a total of 15 years in detention since 1989, had contested an election for the first time following her party's decision to end its boycott of a political system dominated by serving or retired military. 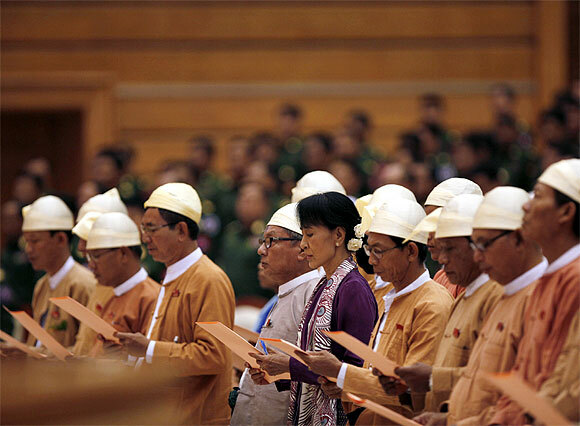 The swearing-in ceremony took place in the country's capital Naypyitaw. Myanmar pro-democracy leader Aung San Suu Kyi signs the register as she arrives at the lower house of parliament at Naypyitaw. Aung San Suu Kyi took her place in Myanmar's parliament on Wednesday, ushering in a historic new political era after nearly a quarter-century fight against military dictatorship. 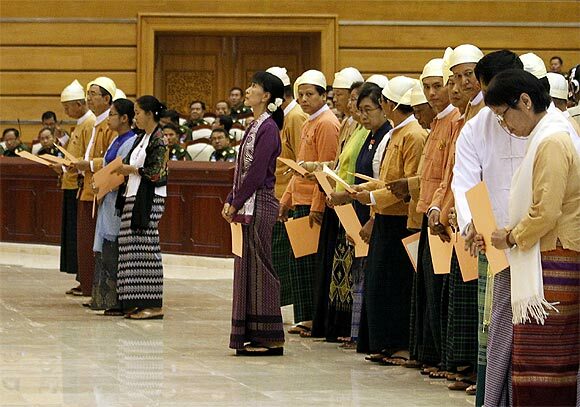 Pro-democracy leader Aung San Suu Kyi and members of parliament from the National League for Democracy (NLD) stand to take their oaths in the lower house of parliament in Naypyitaw. Pro-democracy leader Aung San Suu Kyi walks after a parliament session in the lower house of parliament in Naypyitaw. Pro-democracy leader Aung San Suu Kyi talks to reporters after a parliament session in the lower house of parliament in Naypyitaw.